AFTER POSTING YOUR QUESTIONS TO SGT. SUSIE! 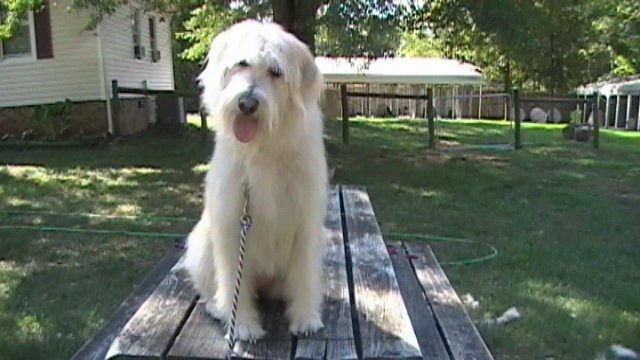 Pictured above is "ZOE" a 14 month old Labradoodle that finished her 4-week Basic Obedience training program by Wagner K9 School on March 10, 2007. YOU GO, ZOE! Zoe is great! Patrick took her in the front yard on Monday on-leash, but no fence. She STAYED and held it for about 15 minutes while he took pictures of our trees in bloom! I've walked her several times, and she has been great with distractions....squirrels, cats, dogs, and people. I make her sit before we cross any street and practice the sit, sit-stay, walk about, and she's GREAT! She received many complements on Sunday when we walked. "What a beautiful dog" we were told or "I really like your dog! etc. Inside the house , she's much more manageable & actually stops when she starts to nip at me when I say ,"OUT, NO"...and that's only occurred a couple of times.. much less than previously. 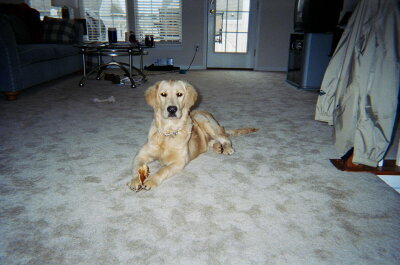 Without the training Amber received by Wagner K9 School, there would have been no way for me to have kept her. What was a really cute little puppy became a big, strong, and active dog very fast. I have been very satisfied with the training and boarding my dog, Amber has received with the Wagner's. Amber was also a very energetic puppy and the training the Wagner's provided was very important in teaching her control. 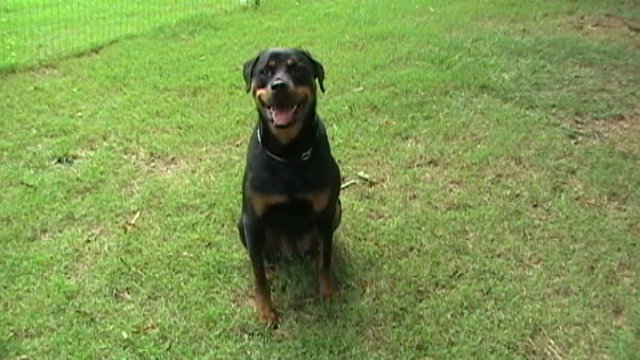 It also helped me know the limits I needed to have and maintain a positive dog/owner relationship. I was also taught what limits I needed to give to Amber and how to handle her in all situations that come up at any time. With the training Amber received she became controlable and knows how to mind. Anytime I have a question about something she was or is doing, I know that I can always ask the Wagner's. 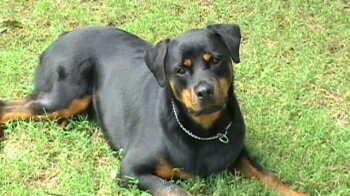 I would recommend Wagner K9 School with no hesitation and I know you will be very happy with the results. Carol Knight pictured here with Amber, also pictured below. that he was stronger and that he was the boss.....because I WAS LETTING HIM!! told me the things that I was doing wrong. Most of all, they told me that they were confident that they could get Ox under control. The Wagners worked with Ox for 4 weeks. Our home was full of 11 visitors! (Matt's family is in town). Before being worked by the Wagner's, this many visitors would have been sensory overload for him and would have been utter chaos! They (and we) were amazed!!! He is the same, loving, playful dog, but he LISTENS! I have taken him on long walks, long rides in the car....I've even taken him to PETSMART..(Something that was an absolute impossibility before). Our household is better, and Ox seems much happier. Before, it seemed that Ox stayed in trouble and that we were constantly having to reprimand him. Now, he still tests us, (I mean he's still a puppy....), but when we say "No", he understands that we are in charge. He is calmer and more relaxed because he now has boundaries and rules! I am so thankful to the Wagner's for giving Ox (and us) the foundation needed to really enjoy all of the wonderful ways an animal can enrich our life! It gave me great comfort to see how much HE loved each member of the Wagner family. If this method of training were cruel, Ox would not have been whining when He saw the Wagners walk up. He loved beingwith them. 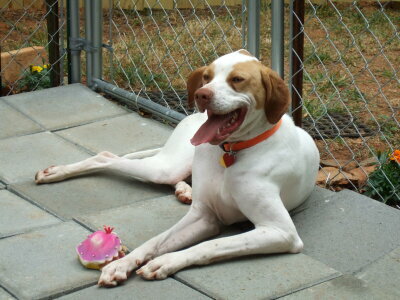 ....loved being handled by confident trainers, and loved the socialization with the other dogs! Thanks for letting me ramble! We look forward to meeting some of you, and your dogs trained by the Wagner's in the near future! 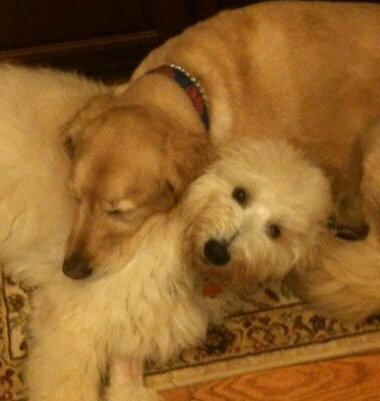 I researched several breeds before deciding "to be owned" by a Golden Retriever. Since I'd never had a dog of my own, and I knew retrievers got to be to 75+ pounds, I decided to investigate puppy classes. After I researched a few options, Wagner K9's program was the most impressive. The training Gumbo received by Wagner K9 School has improved my entire experience as a large-breed dog owner. He's well behaved and easy to work with now that he knows the basic commands. Jake has been a pleasure since we picked him up from training! I was wondering if you could board him this coming week, from 7/16 until 7/23. I would also appreciate if you could pick up and deliver him. I would like to have him picked up before 4 on the 16th and returned before 2 on the 23rd. Let me know if this will work. Building Your Dog's Focus is crucial to having a well-behaved dog. 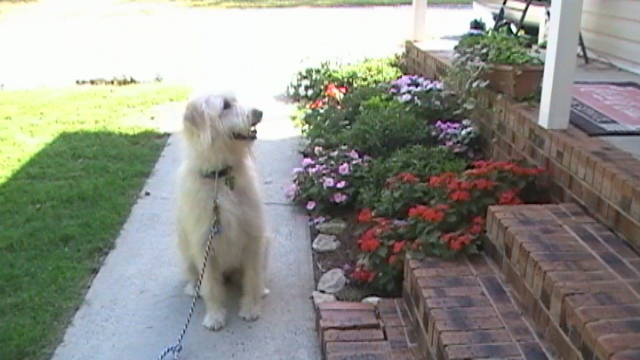 demonstrate that the heel command and exercise is a great way to increase your dog's focus. 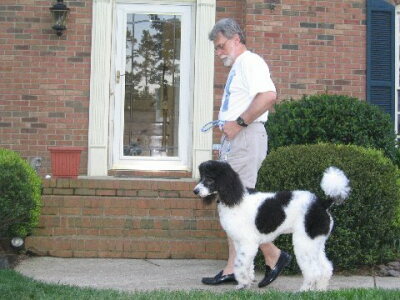 Put your dog on leash on your left side and walk an imaginary square in your house or in your yard. While you walk in your perfect square make your turns to the left as sharp as they can be. This way you walk into your dog and cut off his attention that might be on anything that is ahead of you. While walking the square to the right you are making sharp turns that deter your dog's attention away from anything that may be distracting your dog to the left or out in front of you. If you use this drill while walking and make your turns sharp and precise, your dog will have to focus on you, the handler. You may also try walking in straight lines and doing a quick about face. These exercises will also enhance the automatic-sit. If this drill is performed correctly you will have your dog heeling and sitting properly in no time. Email me if you have a problem. 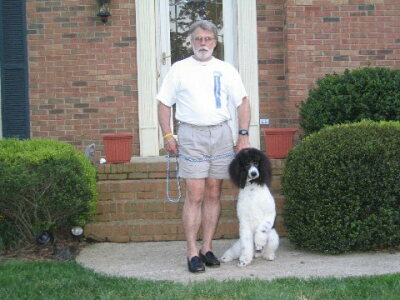 This picture illustrates the automatic sit at the owner's side and the dog's focus that must be put on the owner. The sit-stay builds focus, lengthens the attention span, builds character, adds composure, and builds confidence in the dog. Any dog can be taught to quickly sit, but owners are never taught how to build on this command of sit-stay to increase the dog's attention and focus. At Wagner K9 School, we work with the total dog, building and lengthening the sit-stay and down-stay commands, socializing around other animals, and teaching manners. The dog is put on a good schedule and worked many sessions daily giving the dog sufficient repetitions to become comfortable in each command learned. The owner is taught step by step handling instruction and before the dog goes home the owner knows everything about how to control their dog in every situation. Greg and Gail Campbell have given us permission and have requested that we make available and publish this letter of reference from them onto our web site for all to view. Please click and read. 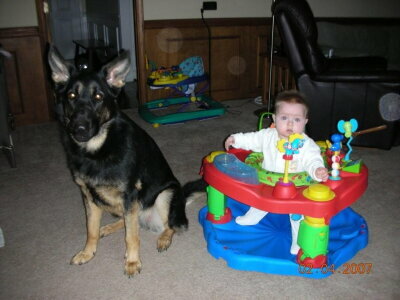 About 11 years ago you trained my 6 month old white German Shepherd. I was very impressed by the results. Sadly, I had to move and could not take the dog with me. She found a wonderful home with a neighbor who's daughter loved the dog. My wife and I just brought home a new puppy who is only 8 weeks old. We have begun housetraining her and leash work. I purchased her from our co-worker who is the Supervisor for our K-9 unit here at the Charlotte police. I had been telling my wife how good you are at working with dogs and hoped you still did when I found your web site. We would like to set up an appointment to visit and discuss enrolling our puppy Scout when she is old enough. Given her bloodline and temperament exhibited thus far, I feel she would benefit greatly and excel at your facility. Please let me know how old she must be and when we can visit. We both work until about 6 p.m. at the police department and are off on Fridays. A picture of the new dog Scout after training and the new baby! Just want you to know that twice a day we work with Trey and Blue and they are doing great. I went to Waxhaw Animal Hospital and told them how great you both were and I encouraged them to send more your way. They said that they needed more flyers from you. I will write a letter as well to put on the board there at the Animal Hospital telling them about my experience with you all and how wonderful and helping you are and what a tremendous difference the dogs have made due to your professional help. Everyone that sees them is amazed. I just can't thank you all enough.